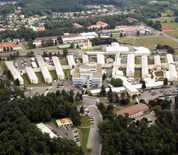 Landstuhl Regional Medical Center is a military hospital located near Landstuhl, Germany. It serves as the primary medical treatment center for wounded service members from all branches of the US military who are operating within Europe, Southwest Asia and the Middle East. The Landstuhl Regional Medical Center has also served as a repatriation point for American casualties. The Center had once been the site of Hitler Jugend Schule, the Hitler Youth School, and several of the school buildings still exist on post today. This Landstuhl Regional Medical Center directory features the critical info you’ll need to navigate through the many facilities and recreational opportunities available on base.